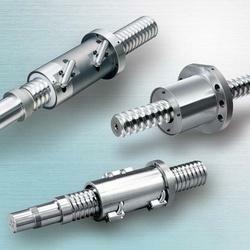 For the diverse requirements of our clients we are involved in offering a wide range of NSK Ball Screw. These are highly demanded in market due to their fine features such as compact sizes, long life and many more. Additionally, these are avaiable in market at economical prices. 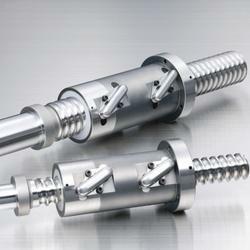 Ball Screw are specially designed to deliver the high performance and speed required for machine tool applications. 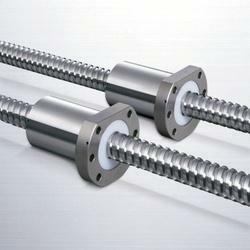 This ball screw offers high speed linear motion, low vibration and noise, high rigidity, high load capacity, and compact nut design. These quiet, clean ball screws feature the same high speed and reduced noise output as the NSK Ball Screw with improved sealing performance. High performance seals deliver more than four times longer service life in contaminated environments when compared to existing ball screws. Specially profiled screw shaft grooves contribute to particle penetration that is reduced to 1/15 over existing ball screws. Maintenance-free K1 Lubrication Units are standard on the ball screws for extended product life in contaminated environments. Noise output is reduced by up to 6 dB and the ball screw features a 25% smaller ball nut diameter for compact spaces. 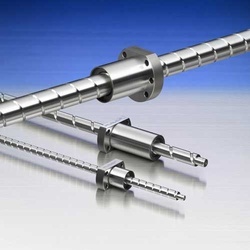 NSK is now offering a quick ship program on NSK Ball Screw. These ball screws are now domestically manufactured in Franklin, Indiana, with a 4-week lead time, offering fast delivery to meet your needs Under this quick ship program, size ranges from 10 mm to 25 mm with various lead and stroke ranges are available. Other combinations are available on a make-to-order basis. For simplicity, the shaft ends for all standard series parts are configured to NSK support bearings. The Compact FA Series ball screw utilizes BSS technology which features: Very High Speed (up to 180,000 DN) Noise levels reduced up to 6dB 10%-30% more compact ball nut Standard grease fitting Contact seal that minimizes grease dispersion to maintain a clean environment Maintenance-free K1 Lubrication Units to extend product life Low profile support units to save space. NSK has developed a double NSK Nut Cooling Ball Screw that has a cooling mechanism built into preload double nuts, a feature that was designed to accommodate the increasing speed and precision of large machine tools. 1. Cooling capacity equal to shaft cooling 2. Preload configuration optimized for nut cooling 3. Improved comparability. We are among the trusted names in industry, indulged in supplying, trading and distributing an extensive range of NSK Ball Screw. Offered product is designed for heavy load applications such as injection molding machines and other factory automation applications within the Machine Tool industry. This ball screw series works effectively with heavy load driving machines that require high speed and high acceleration. Additionally, we also assure timely delivery of our products. 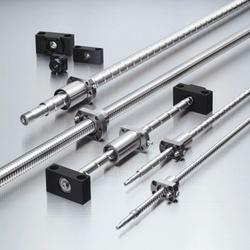 NSK has standardized certain popular ball screw types by creating a standard stock series for immediate delivery with: Machined shaft end configuration for support units (A-Series) Un machined unhardened shaft ends for easy reworking (S-Series). We provide our clients NSK Ball Screw evolved from the best-selling HTF series ball screw designed for heavy load applications such as injection molding machines and other factory automation applications within the Machine Tool industry. They feature high speed operation and low noise output. This ball screw series works effectively with heavy load driving machines that require high speed and high acceleration. Looking for NSK Ball Screw ?